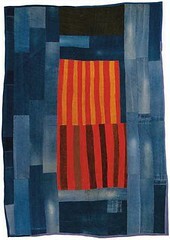 I first saw a selection of the Gee’s Bend quilts at The Museum of African Diaspora in San Francisco. I’d never had anything against quilts before that, they just never struck me all that much. 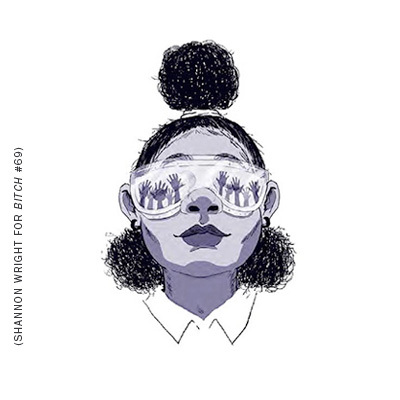 I couldn’t deny that socially, they can bring women and family together in making and sharing them, but the generally rigid/symmetrical patterns, and often pastel colors and mixed floral prints, didn’t grab me. 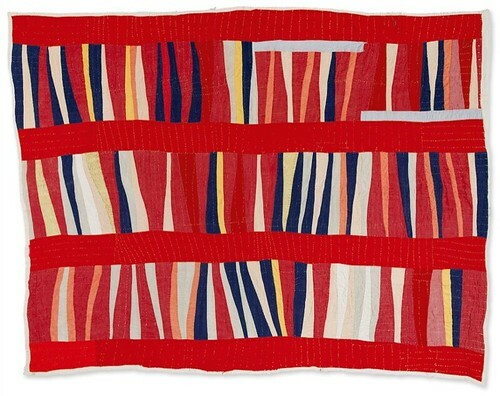 But when I laid eyes on a Gee’s Bend quilt for the first time, I was truly moved by not just the story behind it, but moved on a guttural level by the beauty of the object itself. 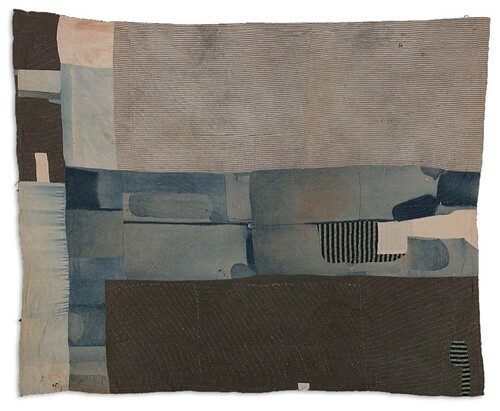 Here was a ‘blanket’ made of fabrics—many taken from retired clothing like jeans and flannel shirts—that was both organic and organized, warm both literally and aesthetically. The quilts are all unique, though share some aesthetic characteristics—most are bold in color and pattern and as a result of this, are energetic—far from stagnant. Not they aren’t contemplative too—I could stare at the patterns with the various organic pieces of fabric interacting with eachother for quite a long time. Gee’s Bend is a small rural community nestled into a curve in the Alabama River southwest of Selma, Alabama. Founded in antebellum times, it was the site of cotton plantations, primarily the lands of Joseph Gee and his relative Mark Pettway, who bought the Gee estate in 1850. After the Civil War, the freed slaves took the name Pettway, became tenant farmers for the Pettway family, and founded an all-black community nearly isolated from the surrounding world. During the Great Depression, the federal government stepped in to purchase land and homes for the community, bringing strange renown—as an “Alabama Africa”—to this sleepy hamlet. While making quilts was, for Gee’s Bend women, largely a domestic responsibility—a necessity to keep families warm and make good use of all resources on hand (old clothing, no longer fit for wear), it was/is also a means of connection between mothers and daughters as well as community—as the final stages of the quilting process were and are often communally done among small groups of women. The process of designing and ‘piecing’ the quilt ‘top’, however, was/is always done by a quilter working alone and seeing through her own artistic vision (sadly the Gee’s Bend website only offers photos of the individual quilters and no further background). Of course, it wasn’t until fairly recently that the quilts were displayed outside of Gee’s Bend homes. And that story, sadly, has some gray areas—namely the relationship and dealings with the man who originally championed the quilts. He’s Bill Arnett, a white art dealer focusing specifically on self-taught African-American artists, and he has now had 3 lawsuits filed against him claiming abuse of copyrights and failure to provide fair profits to artists—namely those whose work as appeared repeatedly on book covers, cards and even Visa cards. However, despite these lawsuits, the majority whose work has toured with help from Arnett are still pleased. 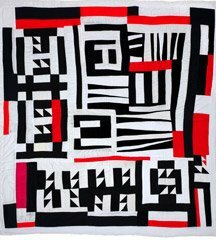 Said one quilter, Nettie Young, “Martin Luther King got us out of the cotton patch; the Arnetts got us out from under the bedsprings and onto the museum walls”. In addition to the solid market for the quilts, the quilts have been featured in numerous national exhibits, two coffee table books, a documentary and greeting cards as well as USPS postage stamps. I saw this collection when it was in SF and the quilts are even more striking in person. Thanks for posting this! This is a super cool post! I didn't know anything about this. Thanks, Briar! This post is exactly why I love the sm[art] blog! 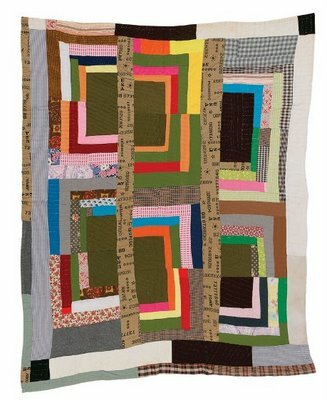 I would have never heard about these amazing quilts (and their equally amazing creators) otherwise. Thanks, Briar! Trump is good at marketing sexism, racism, and homophobia as "nostalgia."